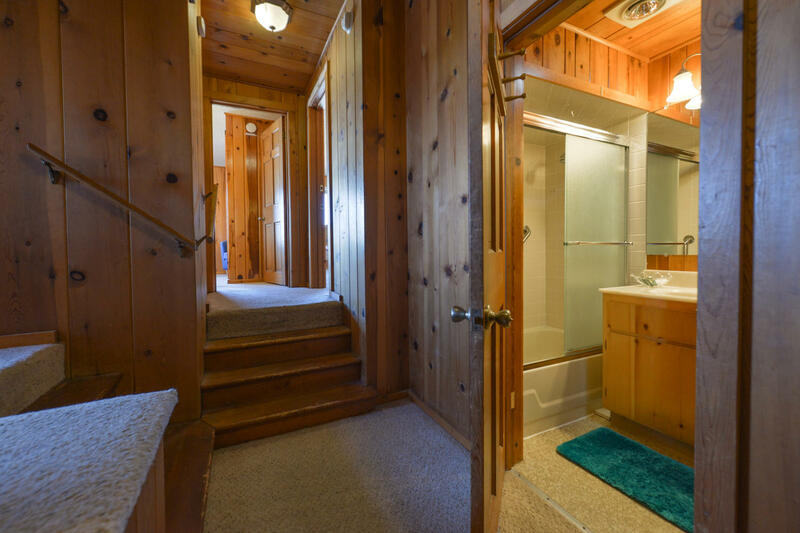 Original Knotty pine cottage with only 12 stairs to the sand! On the ocean in the quiet neighborhood of Roads End. Large deck with a hot tub overlooking the beach. Close walk to tide pools or the Chinook Winds Casino. 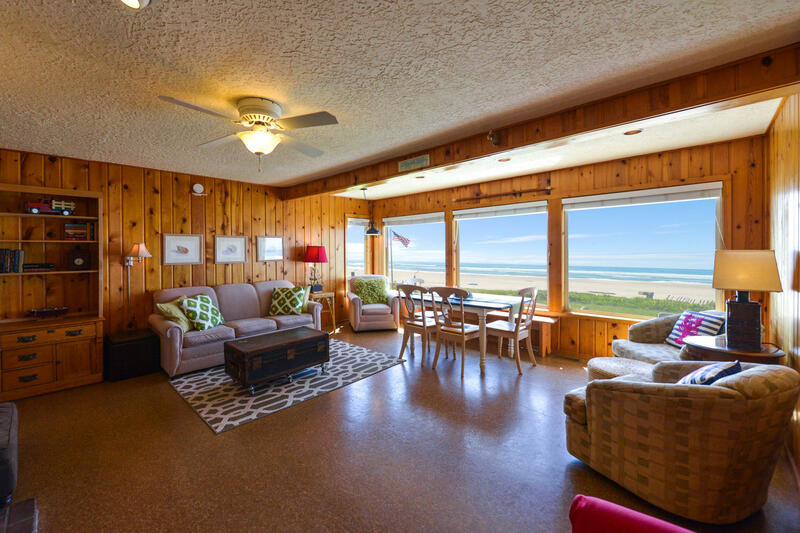 Family room with gas fireplace and huge picture windows looking out to the sand and surf. 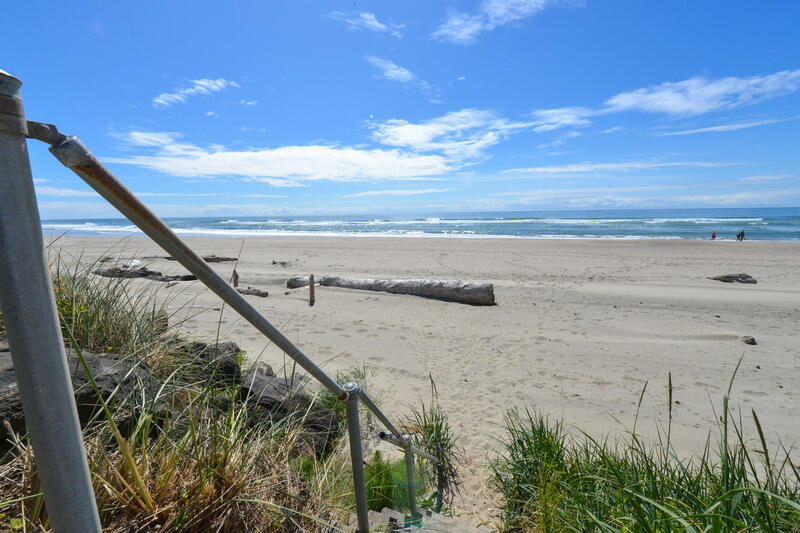 Outdoor shower for after your swim in the ocean, sandy toes, or dip in the hot tub. 3 bedrooms (1 king, 1 queen, 1 double) and 2 bathrooms. WIFI available! Surf light. Flat screen TVs. Covered parking. Our guest book says it best: "We particularly had fun watching people of all shapes and sizes walk their dogs of all shapes and sizes." 'A Norman Rockwell Place'. *Max 6 guests including visitors please--2 vehicles*. SEA STAR NORTH & SEA STAR SOUTH ARE ADJOINING COTTAGES WITH SEPARATE ACCOMMODATIONS. EACH SLEEP 6 GUESTS. Summer 2019 July & Aug. 5 night minimum (unless filling in a gap). Please Avoid Leaving "Single Night Gap" June- Sept. & Spring Break. Labor Day & Memorial Day weekend are 3 night minimums. 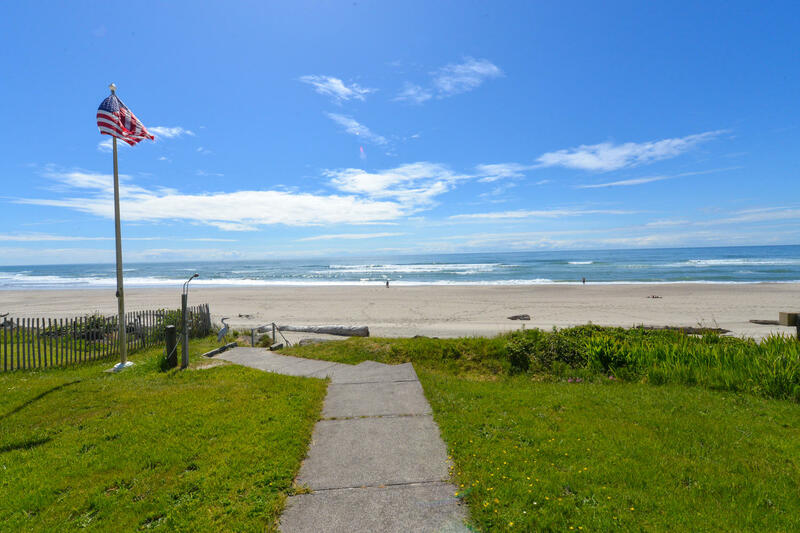 "Another wonderful Beach vacation spent at the Sea Star in Lincoln City. Cozy, comfy little cottage perfect for our family gathering. The location is ideal, just twelve steps to the beach. All the amenities one could ask for. We love both Sea Star South and Sea Star North. We come back every year and will continue to do so ... Our Happy Place!" "We had a great time! 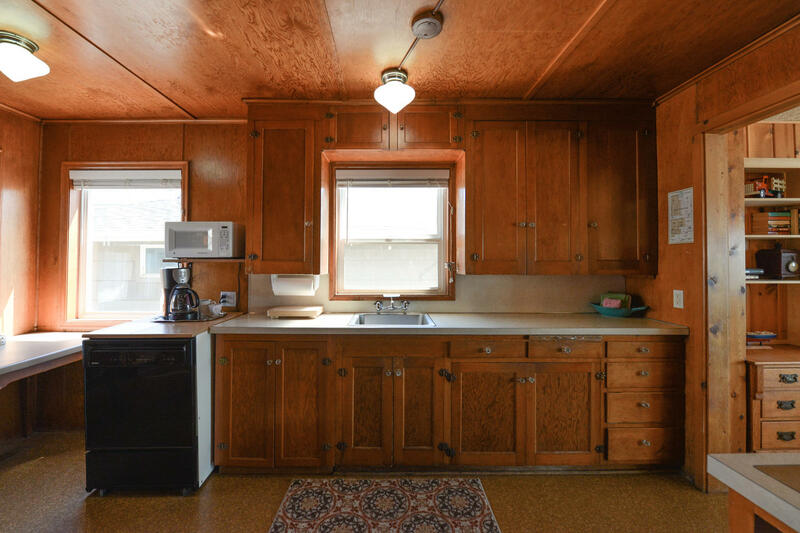 The location is perfect and the house is very dated, but functional. My only real concern is that much of the house has not been cleaned in a while (window sills, corners, etc.) as there was a lot of dust built up in some areas. It could use some updating, but like I said, we had a great stay and made things work!" "Wonderful as always, beautiful weather everyday!" Manager Response: Thanks for staying! Come visit again soon! 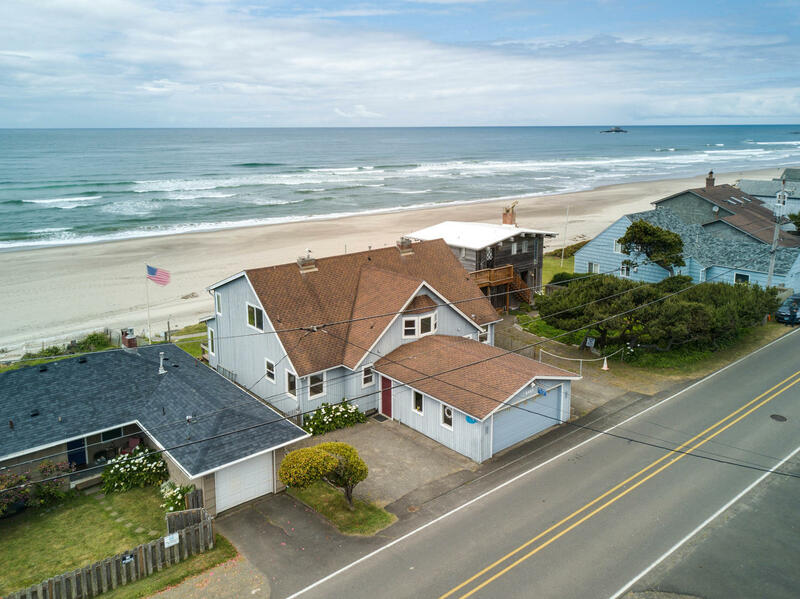 "I have been a customer of A1 Beach Rentals for years.They are a great company to find your perfect beach rental on the Oregon Coast. I have never had any problems with the houses I have rented. They are clean and well supplied. Friendly and helpful staff I would highly recommend A1 for your perfect Beach get away!!!!!!" "I could have stayed here a month. The home had an amazing view of the ocean with stairs down to the beach. 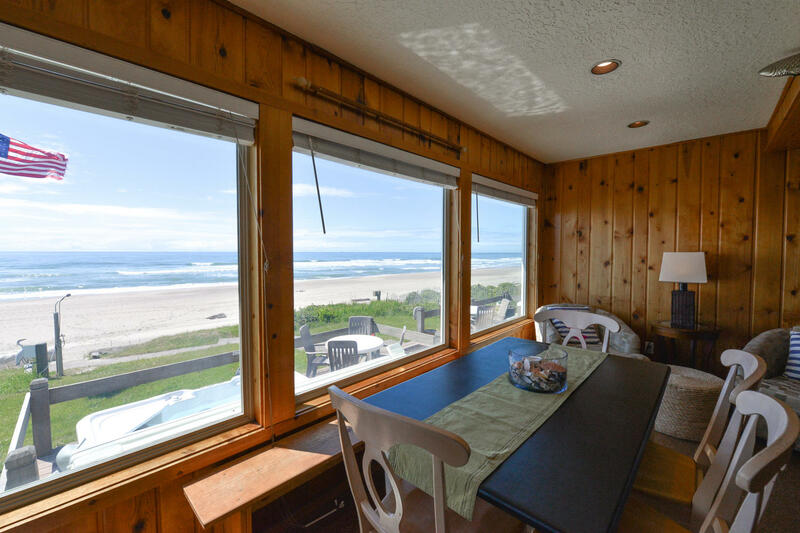 The dining room/living room had hugh windows and faced the beach so you could stay indoors if it rained and still enjoy the view. The bedrooms were spacious, the beds were comfortable, there were plenty of towels, and the kitchen had plenty of counter space and dishes." Manager Response: So pleased you had a good stay! Come again soon! "Nice,except for dish washer is a pain.lots of fun to be there." Manager Response: Thanks so much for staying at Sea Star! Hope to see you again soon! "I have stayed here once,my family has stayed at least 2 other times including Sea Star North. The houses are clean, furnished well and comfortably, can't get you any closer to the ocean than what they are! 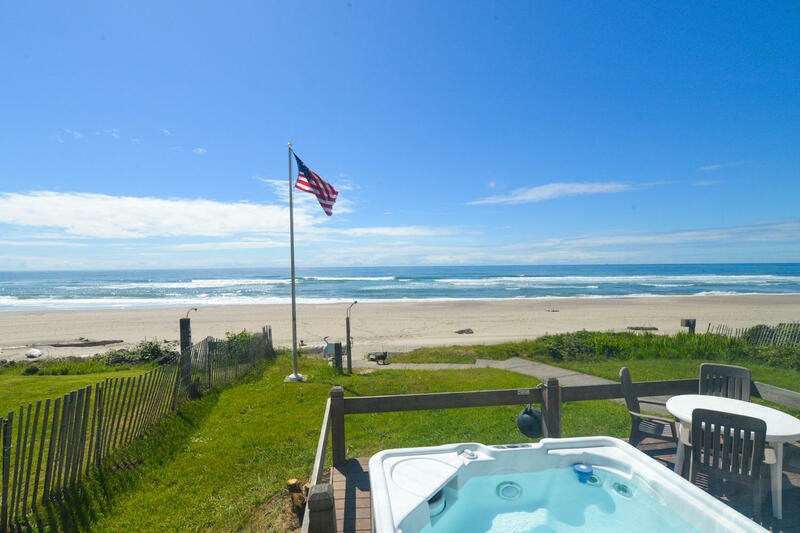 The hot tub is fun to be in while watching the ocean from the porch. And there are 2 full bathrooms. " Manager Response: Glad you enjoyed your stay at Sea Star! Please visit again soon! "We love Sea Star South. It's our go to place when we play in the regional pool tournament at the Chinook Winds. What a lovely little house. The view couldn't be better and it has everything you need to feel right at hom. " Manager Response: Glad you had a great time at Sea Star South and at the tournament. See you again next time! "It was very relaxing. " Manager Response: Glad you enjoyed your stay! Hope to see you again soon! "What a wonderful place, I really hate to tell people about it, I'm selfish.. :) Truly though, an amazing place to stay!" Manager Response: Pleased that you enjoyed your stay at Sea Star South! Please visit again soon! 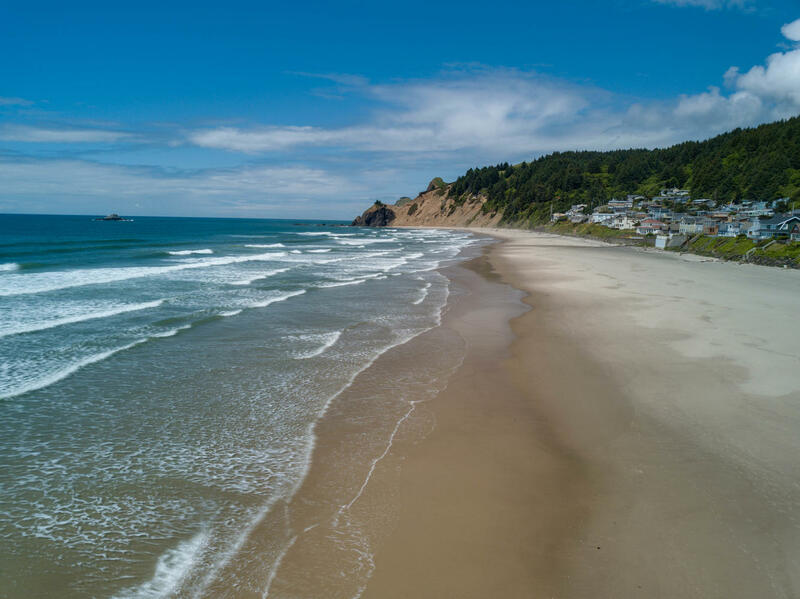 "This was our first stay at Sea Star South and we plan to come back next year (we come to Lincoln City once a year). The view from the duplex to the ocean is wall to wall. 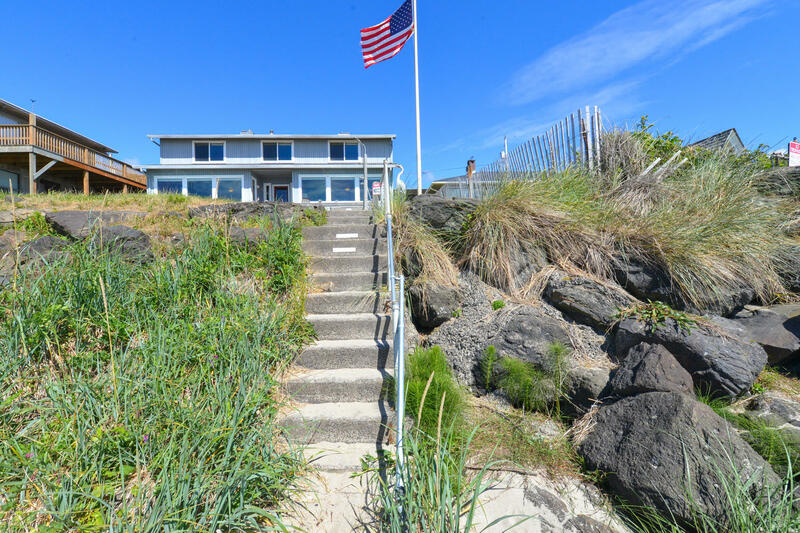 The beach is only 12 steps down from the short walk from the duplex. The Roads End area is my favorite part of the beach along Lincoln City. There were big logs to sit on when I needed and it's a beautiful stretch of beach. All the stairs in the house are steep so the handrails were needed and appreciated. A grab bar for the two steps into the house from the garage would have been helpful. The furniture was comfortable and homey. " 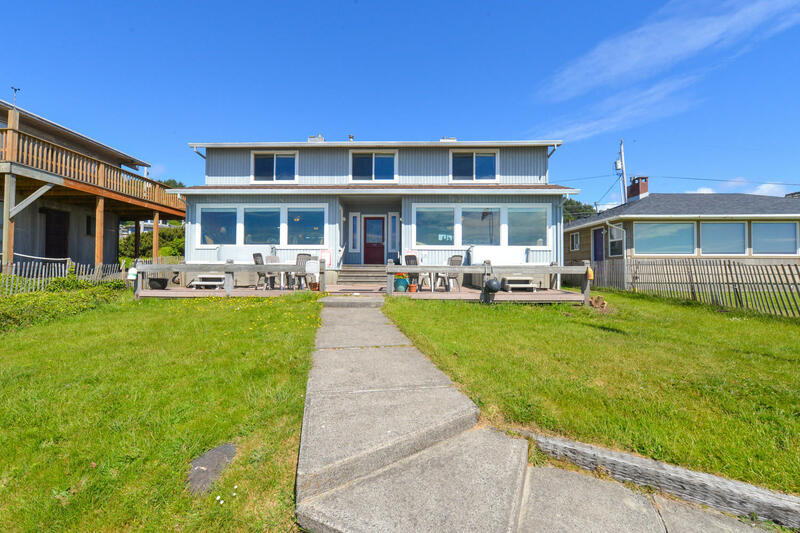 "Other than this being a duplex and having to share the deck with another family I enjoyed everything about this "
Manager Response: So glad you enjoyed Sea Star South! Hope to see you again soon! Manager Response: Thanks for the input! Hope to see you again soon! Manager Response: Thanks for staying at Sea Star South! Please come again soon! 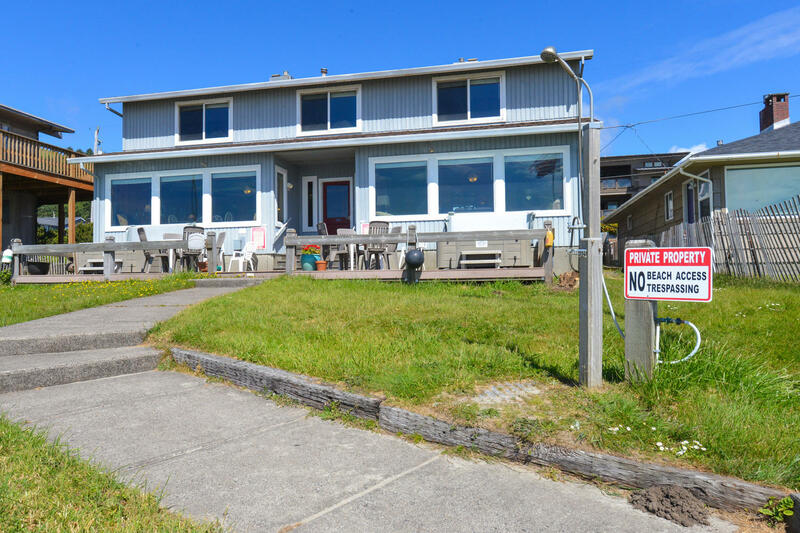 "We loved the location and the large picture windows to see the ocean..the kitchen was well stocked for cooking.we would return..but hope the parking pad edge is painted so no one falls off onto the walkway.. it's hard to see for the unfamiliar.. carpet on stairs really needs to go." "The combination of the home, hot tub and great wheather made it a perfect experience on all fronts." Manager Response: Really happy you enjoyed your stay at Sea Star South! Come again soon! 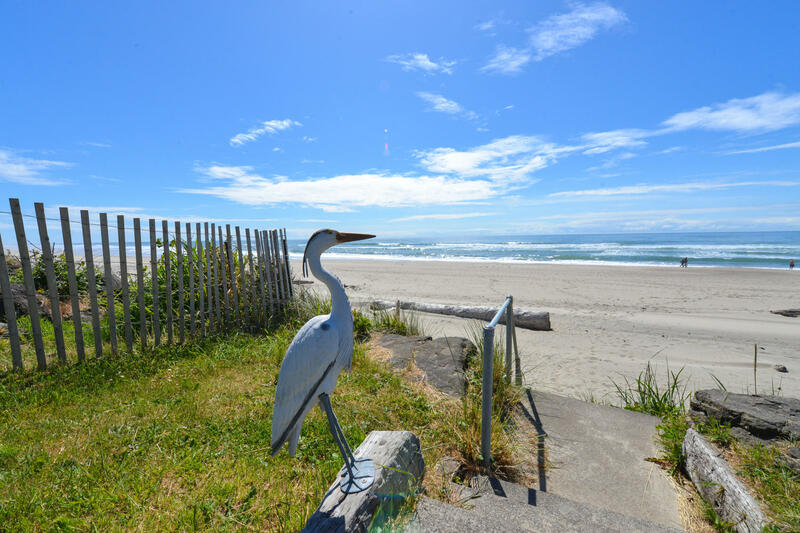 "Perfect location, great accommodations, right on the beach, hot tub is divine. It was really wonderful!" 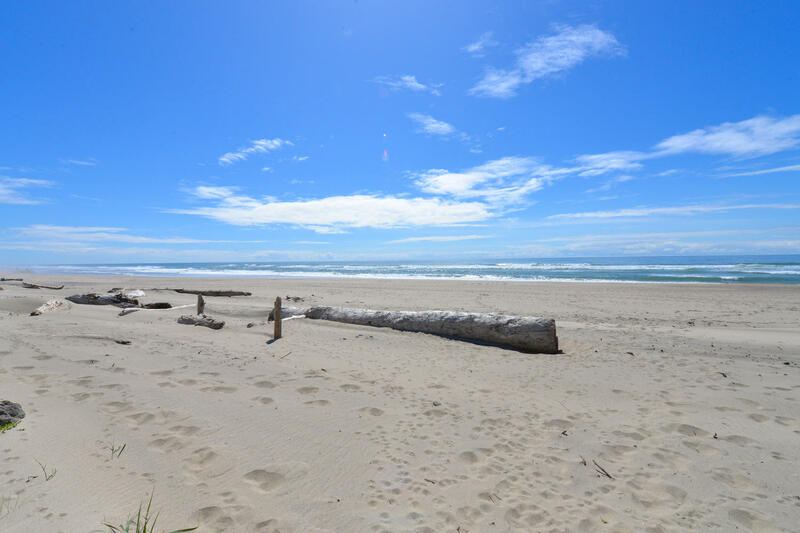 "My mom, sister and I had a great "girls" weekend at the Lincoln City beach. This house was perfect - right on the beach, we each had our own room, everything was close, and the weather cooperated most days. The house was clean and had everything we needed. Also loved the app for my iphone so all the information was right there for me." Manager Response: Thanks for your kind review! Please come visit the beach again soon! "Loved the ability to walk onto the beach. Cute, quaint place for 2 couples. BUT upstairs stair situation very dangerous. One in our party took a spill on the awkward stairs leading to each bedroom. Main stairs dangerously located directly outside upstairs bathroom. Carpet is filthy as is doors around handles. Needs a good DEEP cleaning! " "I was surprised that the home was a duplex, but happy when I realized that it still had great privacy and no noise on the adjoining walls. Very eclectic and comfortable. It was easy to feel at home and the pictures are true to the home." "We loved the Sea Star South. It will be our destination every time we come to LC. Minutes from the Casino, where we play in a pool tourney, and seconds from the beach. What could be better? " Manager Response: Really happy that you had a good stay Sea Star South! Please visit again soon! "This was a perfect little beach getaway! This home was cozy, charming and nicely located. 10/10 would definitely come back! Only complaint was wifi was a little weak but it didn't effect overall experience "
Manager Response: So glad you enjoyed Sea Star South! Please come again soon! "We had a tremendous time at the beach ... once again. It is so comfy and cozy. I dont really want to tout all of the benefits ... 12 steps to beach ... hot tub ... etc., etc. ... for fear it will become that much more popular. We have stayed at both, Sea Star North and Sea Star South a number of times and will continue to return for our family vacation as often as we can." Manager Response: So glad you returned to Sea Star South! Please come again soon! "The home is in a great location. You can hear the waves as you sleep. Beds were ok. And it's hard to leave the view out the front windows. That being said, the house cd have been cleaner, but I'm very picky. We never got the wifi to work, that was kind of a drag because we had to up our data with our plan. We stayed a week at the beach house. 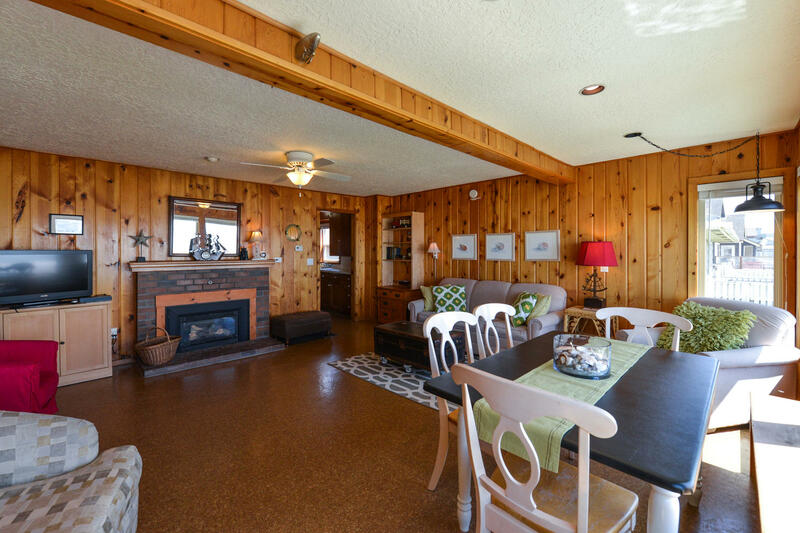 It is a quaint 1940's cabin feel. The beach really made up for the cons of this house. " "Spent three nights at Sea Star South and enjoyed every minute of it. Ocean view from each bedroom was great. 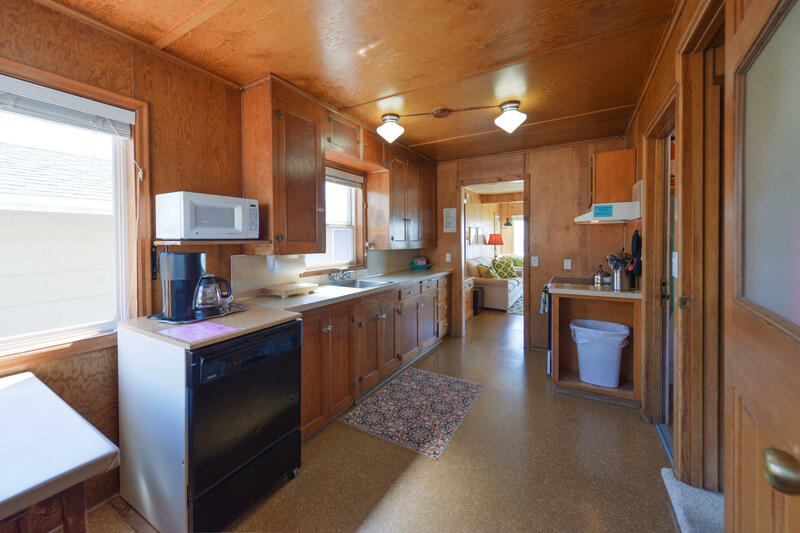 Unit could use a new couch and maybe a recliner, but overall was comfortable." "For the last 3 years we come down in January to spend about 3 nights at Sea Star South and it has become our tradition. We absolutely love it and it has become like our own little get away. Thanks again for offering a awesome spot for us to come chill." Manager Response: Glad that you enjoy Sea Star South! Hope to see you again next year! "We had a great time! This is our second stay here, and even with the stormy weather, the hot tub and great view is still very enjoyable. " Manager Response: Glad you enjoyed winter at the coast! Please come again soon! "As always, A1 Beach Rentals does a fantastic job managing the properties. 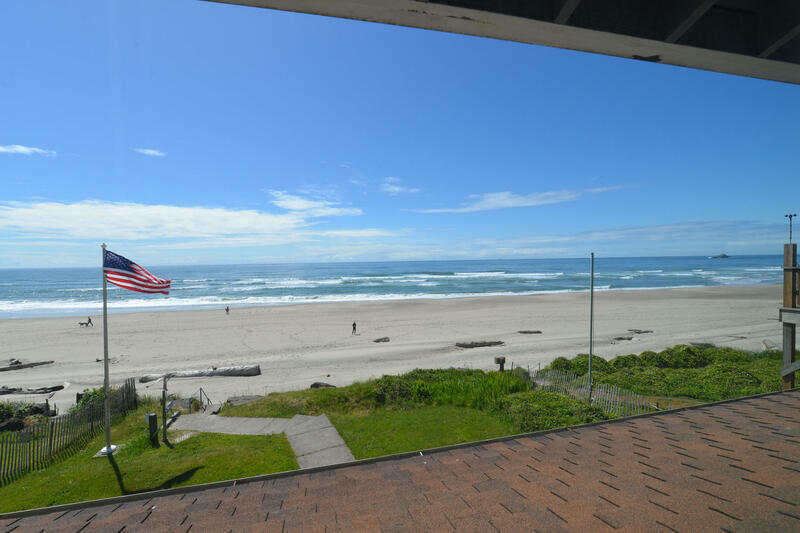 The house was clean and the beach access and view are the best. I have rented from other management companies that do not do as good a job with their properties. I love Sea Star South and the North side too. "Very nice and relaxing. The view is great wether nice weather or stormy!!!" "Incredible, relaxing vacation! Can't beat the location and really enjoy sitting on the deck watching the ocean. I will rent this place again. The only improvement I would suggest is upgrading the wifi. It's pretty weak and you have to move to the garage to get the best signal." Manager Response: Thanks for staying! So glad you had a great time! Sorry about the wifi. It is a bit spotty in the area at times. "Had a great time at Sea Star South, it was perfect for me and my girl friends. We just wanted to sit and watch the ocean, and we could do that from both inside and out. Everything was very clean and felt just like home." "Its our favorite beach house!!" Manager Response: Thanks for coming! Please come back! 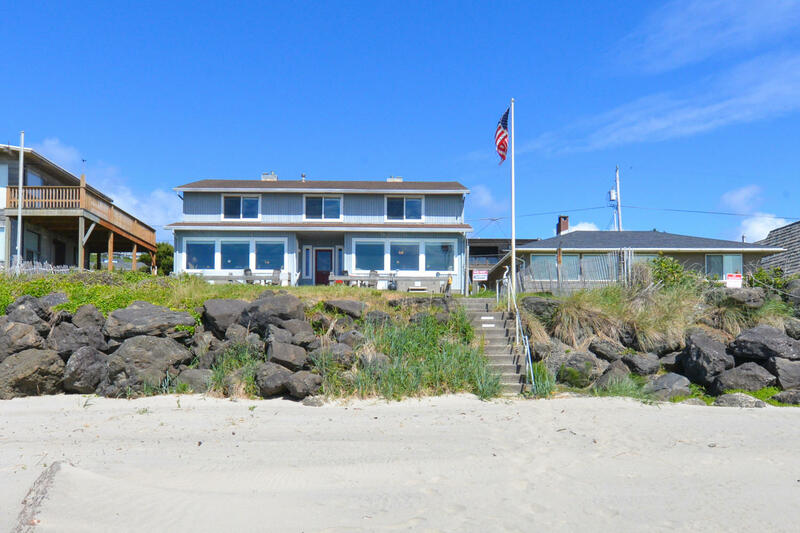 "We loved the house and the exceptional views and beach access. The house had everything we could possibly need. We watched a gorgeous sunset from the hot tub on the deck. I would definately book with A-1 again in the future." "Love the location and home, very comfortable. Everything we needed was in the home. Loved the hot tub. Great view. " "Nice house with a great view. " "The house was fantastic. Beautiful views, comfortable, relaxing and just plain perfect. I would recommend this place to anyone. " "Always a pleasure to stay in this unit. Our family has stayed here on an annual trip since 1988. What we like most about Sea Star South is it feels like home. Re models have been subtle without changining the warm feeling of the knotty pine and fireplace. Great spot." "We stayed at the Sea Star South from 1/20 to 1/24. Everything was there that we needed to enjoy our stay. 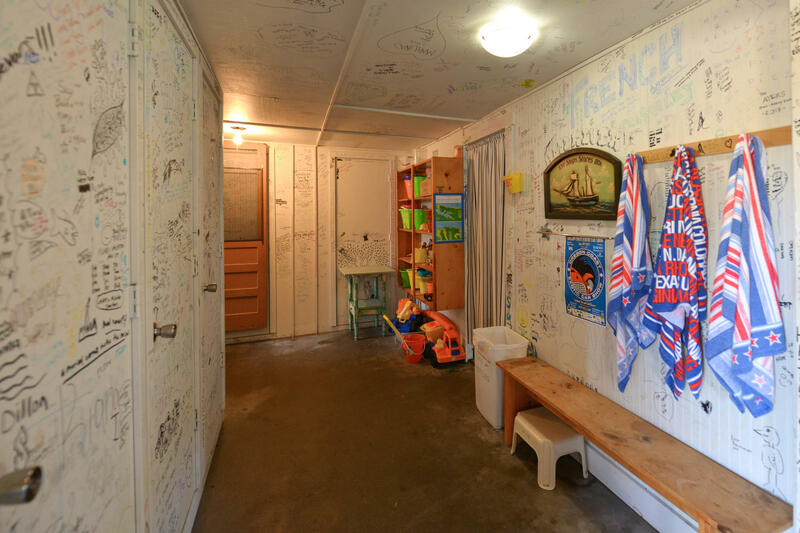 It was great to walk in and see all the writing on the walls and then to walk in to this amazing cabin feeling beach house. I loved the convenience of the location and access to the beach. We will be staying again. " 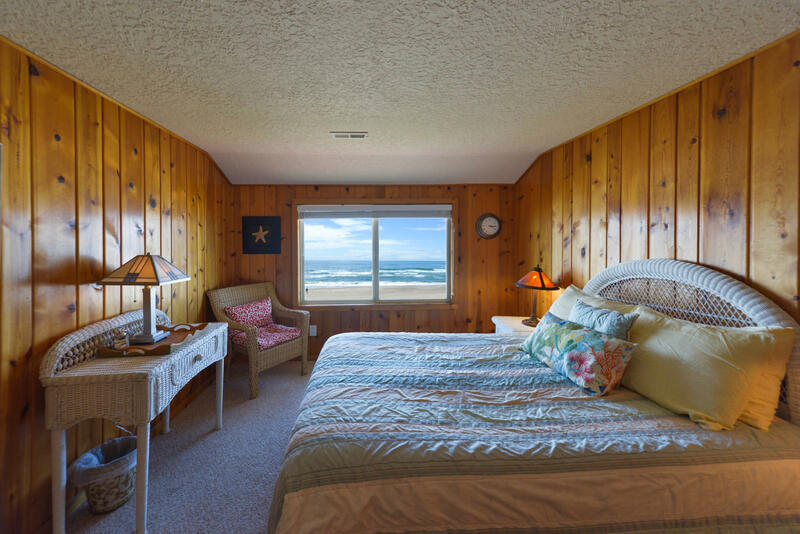 "I have stayed at the Sea Star South multiple times and have thoroughly enjoyed each visit. The view and proximity to the beach are unbeatable. 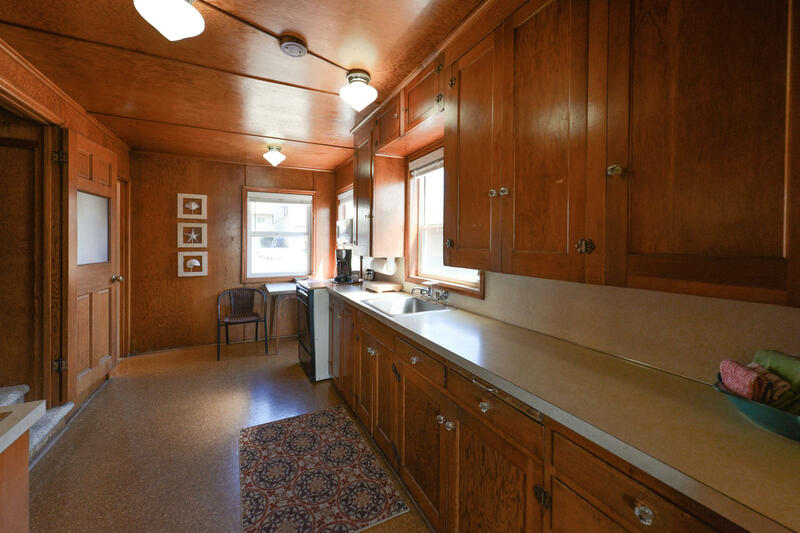 The kitchen has enough dishes and pots and pans to prepare meals on site and a Safeway is conveniently located. Because the duplex is on a dead end road traffic is limited." "The views are absolutely amazing. 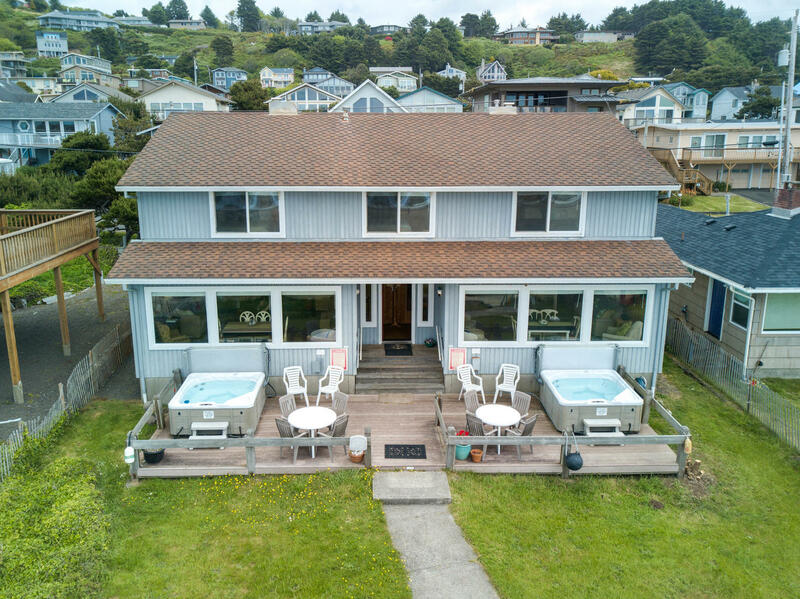 Even when the weather is bad you can hangout at the bay window or hot tub and enjoy the ocean. If you are here for the ocean and looking for a deal, this is the place for you. 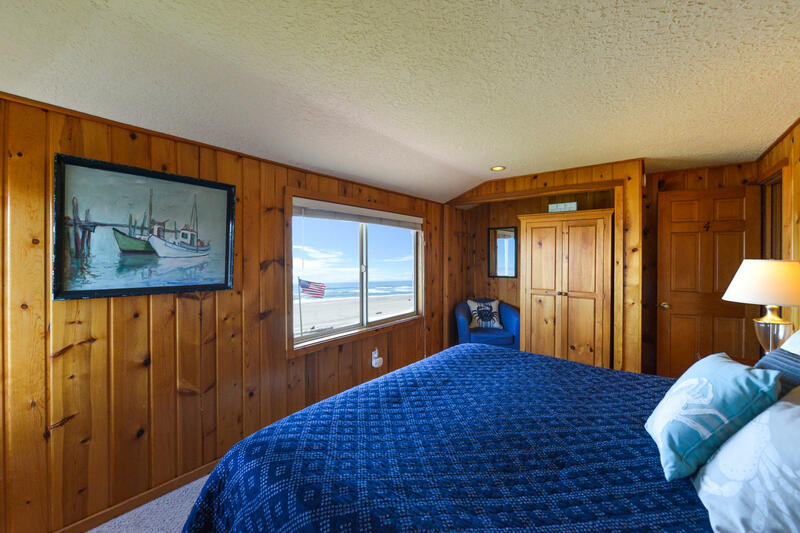 Two of the three bedrooms also have an ocean view. A-1 was really responsive when we needed a fix for a broken door knob. Grab a kite, hit the aquarium, grab a beer or two at McMenamin's. Protips: Three different cell phone carriers got no service at the location and there is no house phone. So if you need access to phone this might not be for you." "We were very pleased with our stay. It was definitely a home away from home. Even the weather was perfect (sunny and stormy)! The only thing that would have been nice to know is that neither of our vehicles (truck/jeep) would not fit in the garage, it was too short. Other than that, it was perfect!" "We were 3 couples who got together after 7 years apart. We used to have many weekends together out at Lincoln City with great and fabulous memories. This stay was the first in many many years and it was great." Manager Response: Thanks for staying! Please come back soon! "Worked perfectly for our group of five. Super easy access to beach. Clean and well stocked! " "I would recommend this place to everyone." "I'm hesitant to leave our review of Sea Star South as it will make it harder to rebook. IT WAS FABULOUS!!! Clean, cute, comfortable, completely appointed, great location, best rental experience we'very ever had. A-1 had great communication and quick responses. Can't wait to book again!!" Manager Response: So glad you are pleased with your stay! Come visit again soon! 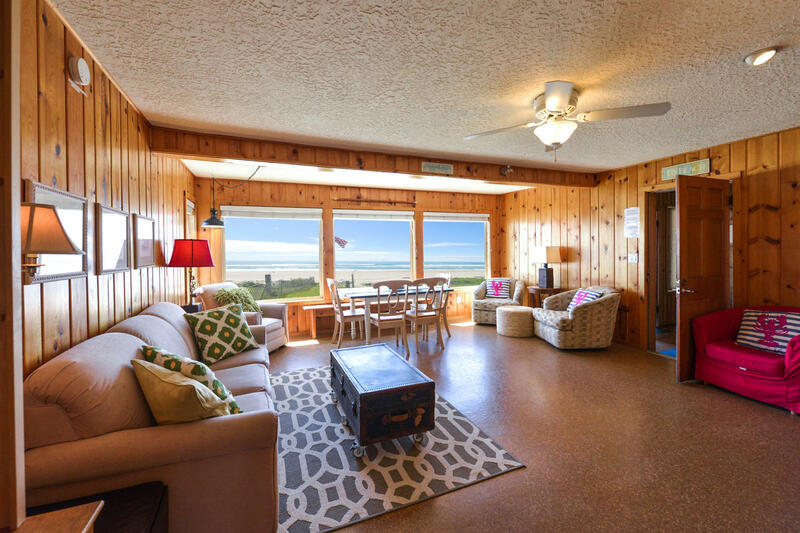 "When looking for a vacation home, our main criteria was location, location, location. This place certainly delivered! Just down the steps and we were on the beach. This was the perfect home for our family and we will certainly be back!" Manager Response: So glad you enjoyed your stay! Please stay again soon! "Very relaxing time had by all!" Manager Response: Thanks for coming! Glad you enjoyed your time at the beach! "Very nice we have stayed there before, love the location. We would recommend it to anyone." "Although this unit was dated, the location was great and we had a fun time watching the huge storms of October roll in. " Manager Response: Glad you enjoyed the storm watching! Please come back again soon! "We have stayed here many times, and love the place. It's like an old shoe that feels like home. The location is great, and all the windows in front make the place. Will stay here many more times." Manager Response: Really glad you enjoyed your time at the beach! Come again soon! "I coordinate getaways for different groups of friends and this was by far the best! The location was perfect and the booking and check in process was easy. The house was fully stocked, comfortable and had pretty much everything we needed. The rooms gave each couple the privacy they needed. The upstairs shower is small, ideal for a short person but downstairs is big enough for a big man. Bring your own grill. Dont leave food out overnight on the counter by the sink because ants will appear. Lesson learned the next night and we didn't see them anymore. There were plenty pots, pans and serving dishes. We all signed the wall- built a beach fire and took long walks. The weekend weather was beautiful and this house would be perfect for stormy weather too. This is a duplex, but nobody stayed next door. 3 more couples on the other side would've been fun. The phone signals were bad and we could only make calls in certain spots on the beach, or as we went closer into town- but we weren't worried about phones. Wifi signal was ok... The front door and porch are shared and each unit has its own entrance. We had the best weekend!!! My boyfriend told me he felt like a millionaire when we got there. Thanks to A-1 Beach Rentals for being so accommodating. Karen you rock!" "Enjoyed our stay at Sea Star South. Quirky upstairs bedroom layout but each room had its own charming décor. Beds were very comfortable and I slept really well. Nicely decorated with beachy items from the past which fit into the age of the rental. The games closet was a great idea. Appreciated being able to park the car in the garage. Nice view of ocean and beach from main room and bedrooms. Easy access to the beach. Would like to know the history of this 1938 building. 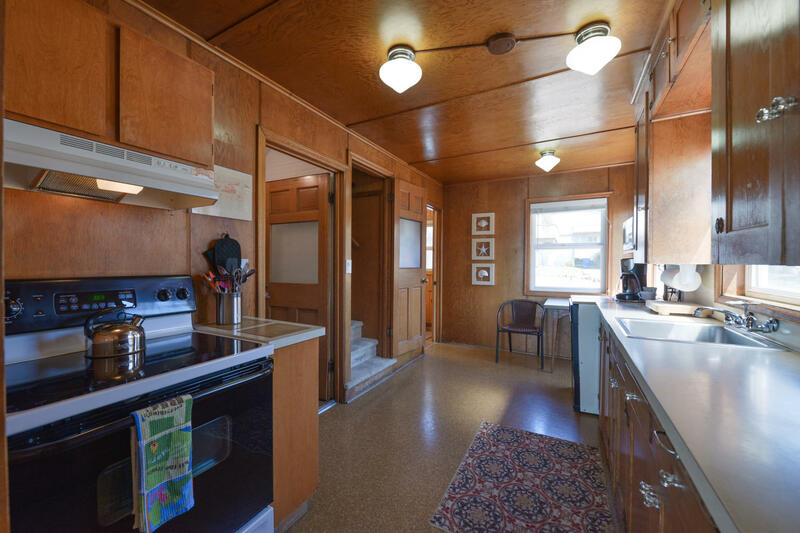 Was it originally built as a motel, a duplex home, or single home? 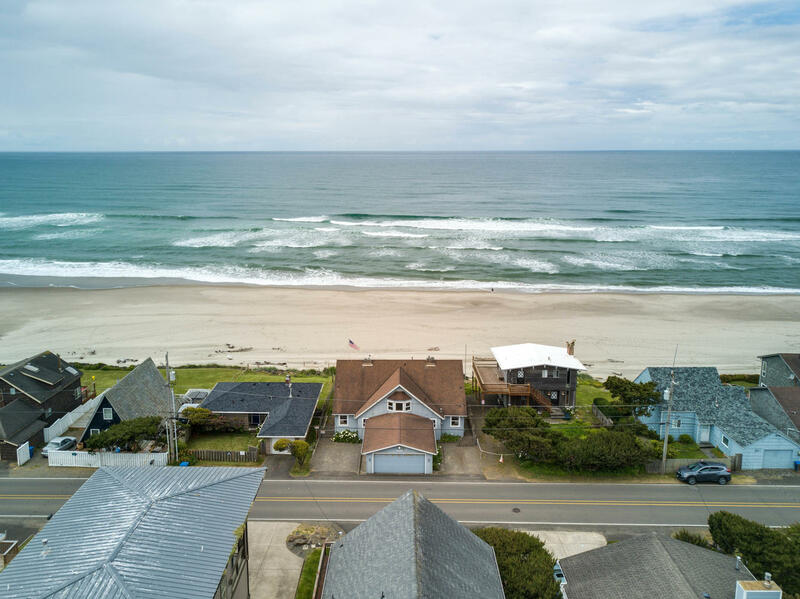 I have had no problems with A1 Beach Rental properties and like its ease of booking accommodations, checking out and all the information about each rental on the website. We'll be back to enjoy more vacations with A1 Beach Rentals." Manager Response: So glad to have you stay with us! Please return again really soon! "The house is in a wonderful location for us. We had a great time at the ocean. What a great way for us to bring in the New Year. Beds were comfortable and fireplace was great. I was so thankful for the highchairest that was available. " "Great beach location. 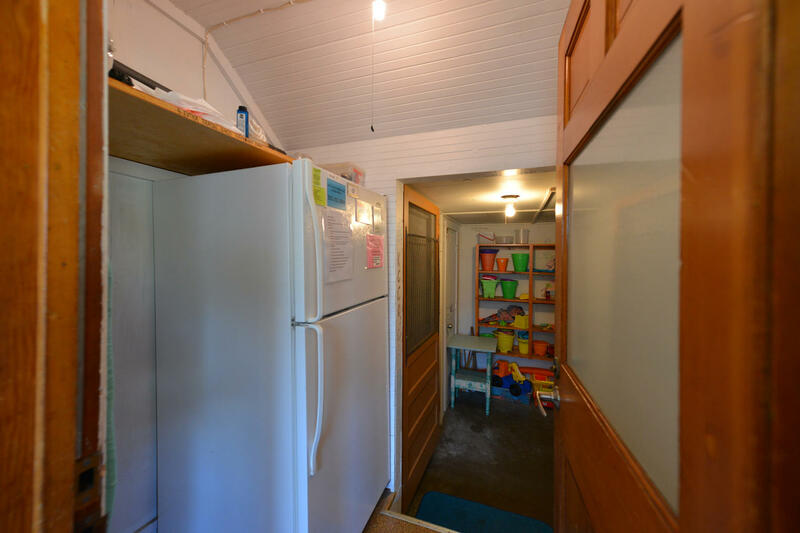 Didn't realize this was a duplex and such a shared space (garage and entries). Had some minor issues but A-1 Rentals was right on top of it and handled our concerns." Manager Response: So happy we were able to take care of that in a timely manner! Please come visit again soon! "Sea Star South is a great place for a get away and luckily, the guests next door were pleasant people also, since we tried to open their door when first arriving. We had no idea the rental was a duplex. I do not remember it being mentioned in the description on A-1 Rentals or . Turns out, our neighbors had the same problem, and tried to get in on our side when they arrived. Once we figured out which door/side was ours, we were greatly pleased with the accommodations. There was only one small "issue" in the duplex. There were ants in the kitchen, so no leaving food/crumbs out. The hot tub was glorious and in a great spot, being able to get on the sand in little to know effort, all the huge windows for a wonderful view, the fireplace, the unique upstairs, and cleanliness all made our trip a great one. " "Everything was wonderful, we only had one problem and that was there was ants in the kitchen"
"Love the view and closeness to the beach. Didn't expect the extra stairs to each bedroom upstairs (not pictured in photos). Probably not suited for elderly family members. Good supply of kitchen items. Overall the duplex suited our group and I would come back in the future. " "Love the house! Would appreciate stronger wifi and a blu ray player"
"We stayed two nights, during a particularly stormy time. Perfect storm watching, in front of the gas fireplace. The only reason I gave the general condition a 4 star is because the furniture is not set up for great conversations, or enjoying the fire or view. The instructions are very clear that you may not move the furniture. Other than that, we loved it. " "We had a wonderful time at Sea Star South and especially enjoyed the proximity to the ocean. The hot tub is a nice feature and we even saw a whale during our stay. The home itself is cozy, and met all basic needs. It was nicely decorated and a short drive to the Casino and town. I would say that it could use some updating as far as the carpeting and beds are concerned. The kitchen is a bit small for a more involved meal, I will just plan easier meals next time! 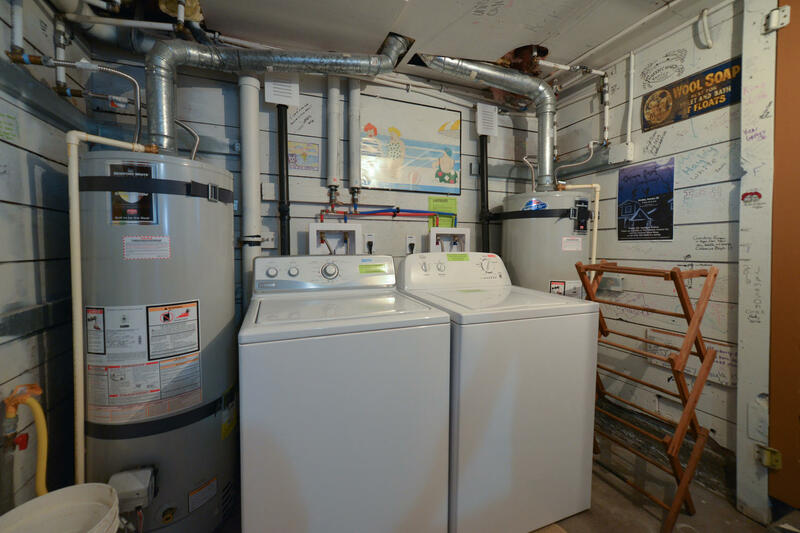 The laundry is shared between the two units, so it felt as if we should have scheduled when each unit could use the washer and dryer as we ran into some issues there. It is also a very small HE washer/dryer, which meant only HE soap (which we had to purchase), and much longer washing and drying time. The management was very friendly and helpful, addressing any questions promptly which was greatly appreciated! I would stay here again and would definitely recommend others to stay here as well." "There was no laundry soap to enable us to throw in bed sheets before departure. 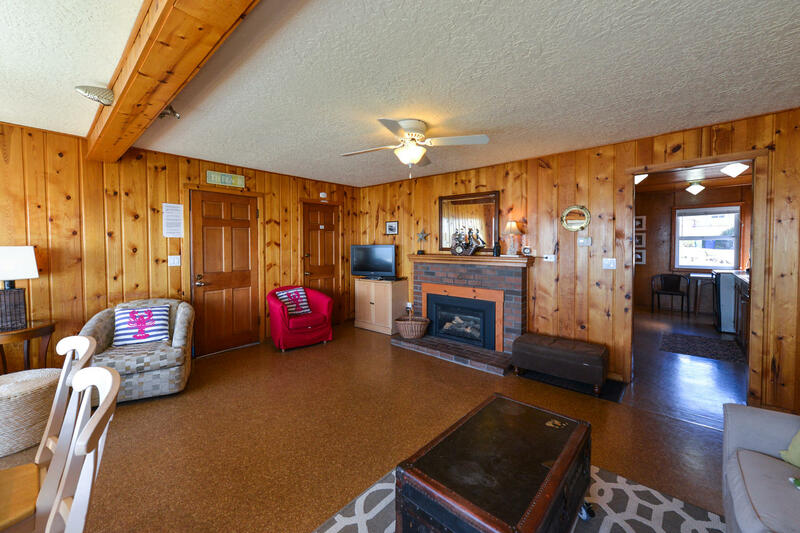 Overall, this was a fun house and we enjoyed the hot tub and proximity to Chinook Winds." "House is as described and worked very well for our needs-Girls Escape. My sister, daughter, and I spent four nights at Sea Star South. Beds were comfortable, hot tub soothing, beach right below unit, pretty much everything one might need. Portable dishwasher worked, but could have used a bit of specifics about turning water on and off-however no problems. Great stay!" "We had a great time at this duplex. Location is fantastic - only steps to a nice beach. Also not far from Safeway, which was convenient. Overall a pretty comfortable place. We stayed with our kids, who were one and four - the door to the stairs closes which was nice from a safety standpoint. There were a fair number of breakables we had to put away, but otherwise I felt it was pretty child-friendly overall. " "Love this home! Have stayed here twice and plan on staying here again next year! 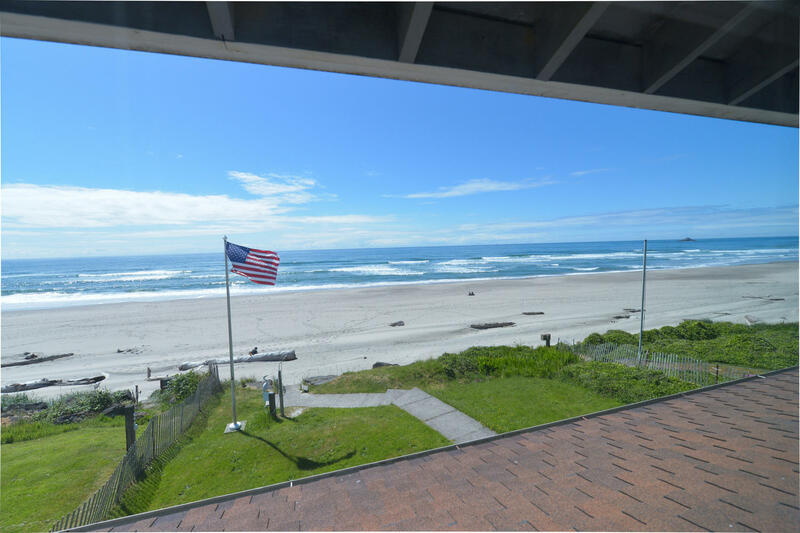 Home is well equipped, beds are comfy, and the view and private access to the beach can't be beat. Very homey and warm, and comfortable!" "I thought the place was wonderful. The only thing I would have changed is the fact that the people next door were way to noisy. I think they were very destructive to your very nice property. I was glad when they left. The next people that came in were good to be next to. But other than that I thought it was wonderful." "Great views. Easy beach access." "Wonderful location and very comfortable home. Loved the windows all across the front for a fantastic view of the beach and ocean. Truly only a dozen easy steps down to the beach. Two things to note: all bedrooms upstairs so not the best for someone who has trouble with stairs and while it is well stocked with dishes, pans, utensils, etc., you do need to bring your own consumables (foil, plastic wrap, etc. definitely going back here - as soon as possible!" "Well done A-1! Sea Star South is a perfect escape from the snows of Montana. All facilities top notch. Spotted a whale from the hot tub! See you next time. And Thank You!" 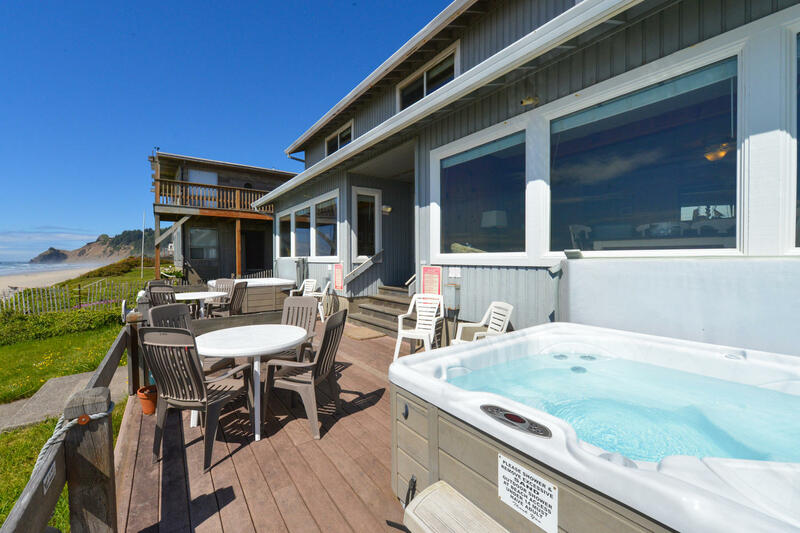 "Love Sea Star, great ocean views, hot tub was fun, great access to the beach. Cozy place with everything you need for a great stay. " "Beachhouse was great. It came with everything we needed. The one thing we weren't happy about were the very short and small showers. My husband is 6 ft 6 inch tall so it make showering very uncomfortable for him. " "We had a wonderful time will diffently come again and would recommend to anyone"
"My family and I had a great time at the Sea Star South. 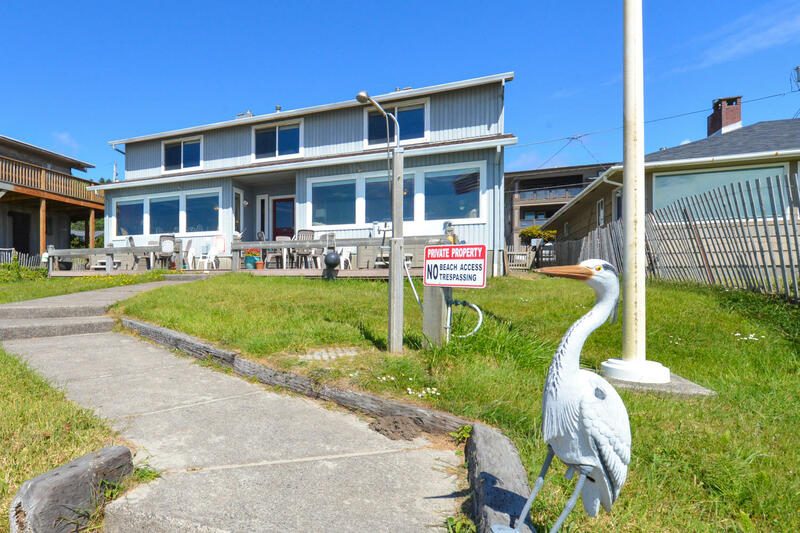 The property was very cozy and had great access to the beach." "We had a lovely time. The location is great and the house was clean and well equipped. " 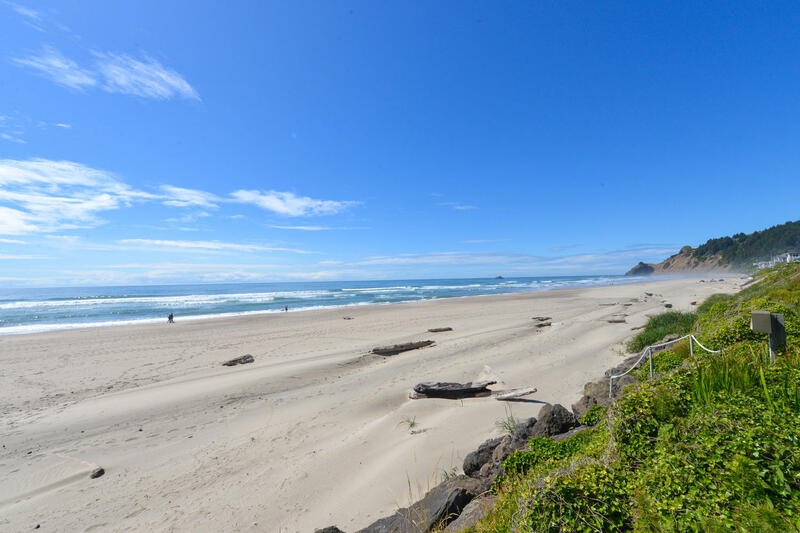 "We six friends (now in our seventies and eighties enjoyed our stay at Sea Star South, especially the ease of getting down to the beach. 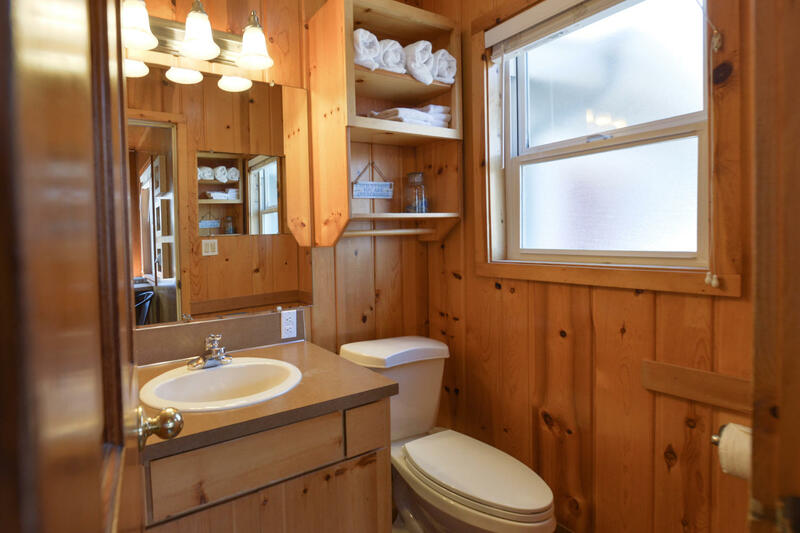 We were very please with everything about the cottage and were particularly impressed with the extras: hot tub, BBQ grill, books, games, even lots of coffee filters. Thanks Karen and staff. " "It was wonderful! 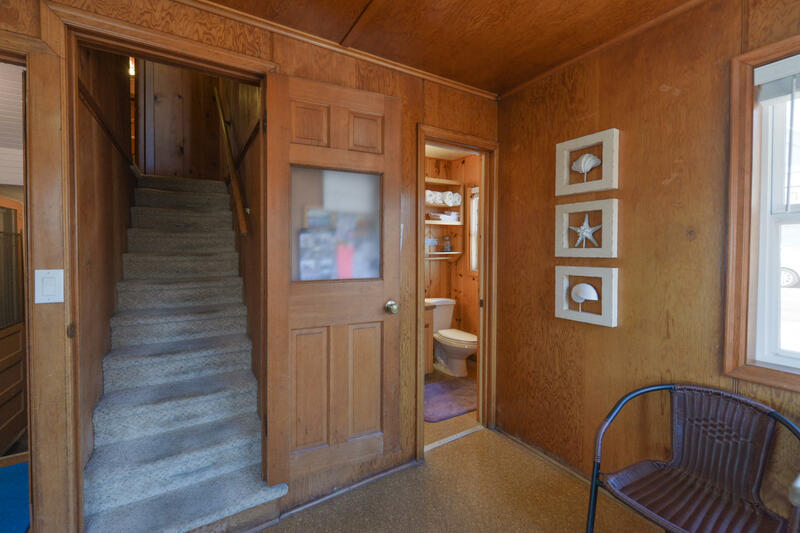 Only complaint is the stairs to the bedrooms. My girlfriend and I aren't young any more so getting up and down was difficult. We got it though. We were never able to connect up the VA so you might have your cleaning staff connect it when they get done as a last item on their list. Overall we had a wonderful time and being from Kansas the view was breathtaking. Thank you!" "As always we had a great time. We've been coming here for about 6 years and enjoy it every time. Wouldn't stay anywhere else. We advised the cleaning service about a dripping in the downstairs bathroom sink. The only thing that needed attention. Steve & Linda Melton, Townsend,Montana"
"We enjoyed a wonderful three generation getaway. The Sea Star's are both perfect family gathering places. Only a few steps to the beach make grandma's knee's happy and the outdoor shower makes for quick toddler clean ups after building sandcastles. The relaxing hot tub was perfect after long beach walks and with views that were breathtaking! We like the door to keep the little ones from creeping upstairs and it also affords quiet nights! Our pilot light had gone out on the fireplace in a storm, but one call soon had someone over to fix it and the fire was a treat. We were delighted with all the beach toys and especially the wagon for pulling a little one home after a long walk. The Roads End area is a favorite and now The Sea Star's are too! " "This is a great place! Perfect ambiance with knotty pine, hot tub on the deck fits 6, very few steps (about 10?) 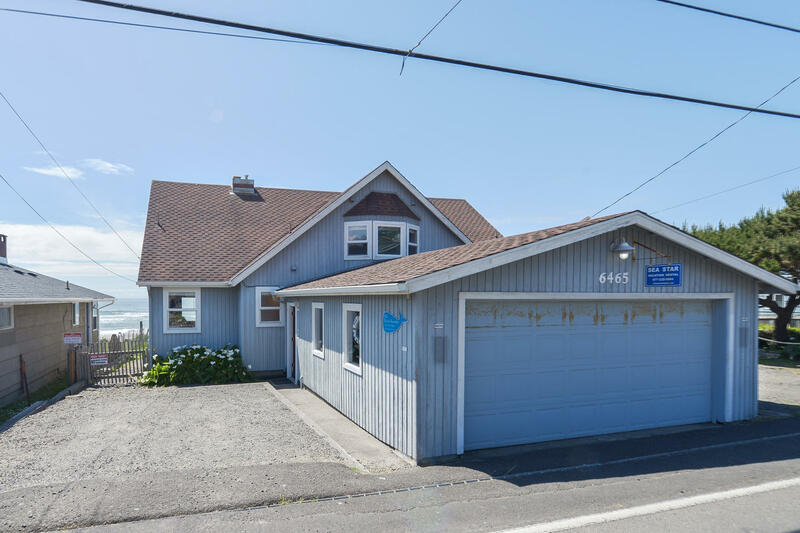 to the beach with hand rail, kitchen well stocked, plenty of room for 6 people to hang out and relax, dvd and vhs players, great view from 2 of the 3 bedrooms, very comfy beds, short walk to tide pools, never heard the neighbors. 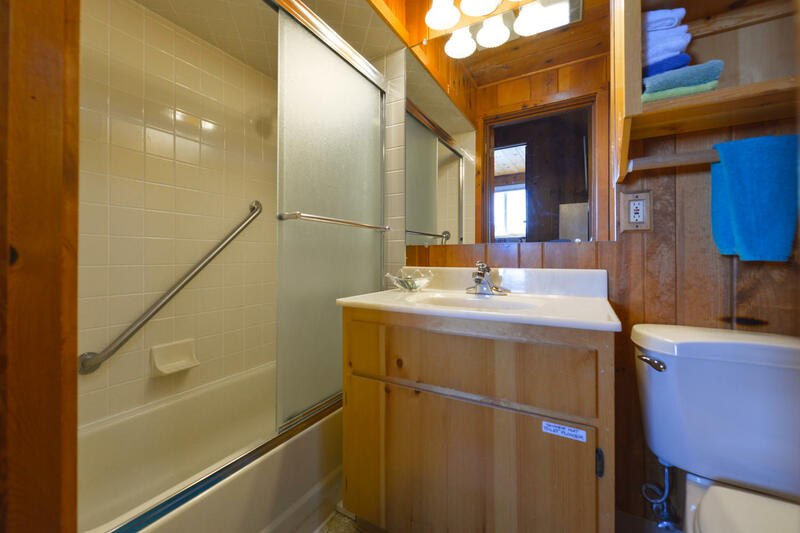 If you have elderly people, be warned that the stairs to the bedrooms are steep and narrow, and while the shower head is strangly low (just bend your knees), there is room in the shower for a small bath chair if needed. Overall, we love it here!" "This is a very charming house with a million dollar view! 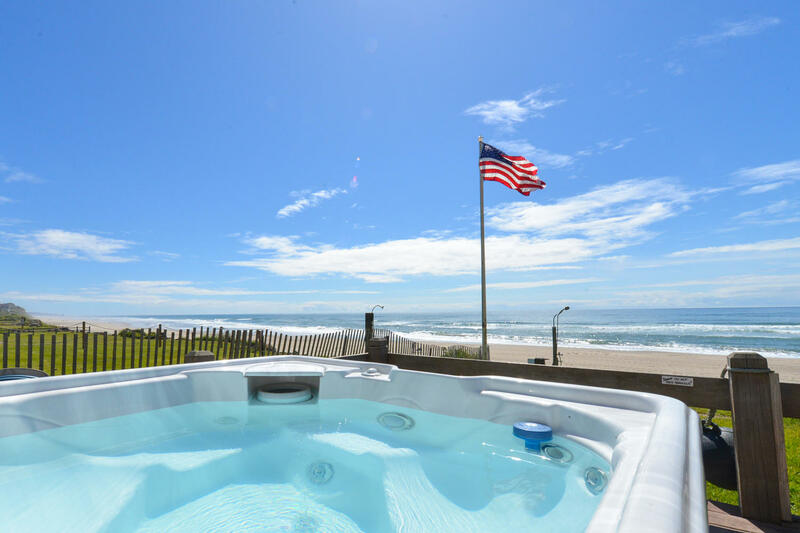 Hot tub looks right out to the ocean and you are literally only a few steps away from the beach! Very family friendly home as well and a great closet stocked with games etc. " "This house was perfect for a quiet get-away. Clean, amazing location right on the beach. Views from all bedrooms.... can't go wrong and can't wait to return." 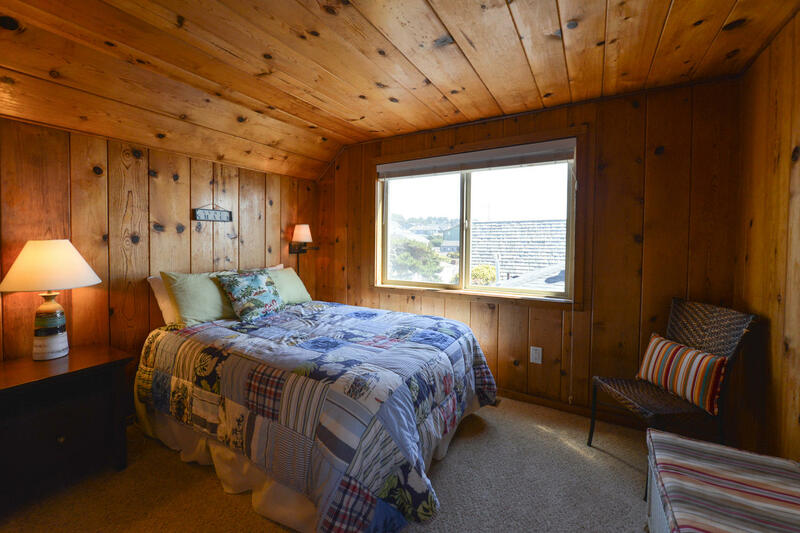 "I am a repeat guest at the Sea Star North and south and find it to be a very comfortable place to stay with a spectacular view of the ocean. The location is convenient to access local attractions and eateries and a grocery store is only a short drive away. Beds are comfortable and the extra blankets are appreciated. The kitchen has a variety of pots, pans, and dishes making preparation of meals pretty easy. A washer and dryer are available, but guests need to bring laundry soap. The Sea Stars are a great place to gather with friends and family!!!" "Wonderful spot. Nicely updated and very comfortable for a family stay. It should be noted that parking inside the garage is only for compact cars." 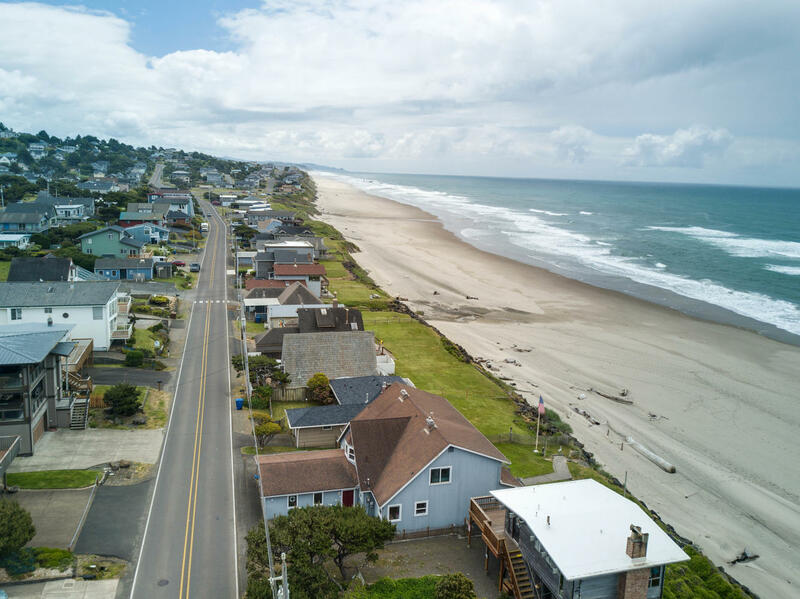 "We love Lincoln City and were thrilled to find this little house for our mini-vacation. It's in a perfect (for us!) location--right on the Road's End beach, where it's a bit quieter and the beach is right outside the back door. The house has a 'vintage' feel but that made it quite charming. Modern (enough) amenities. Overall a great stay!" 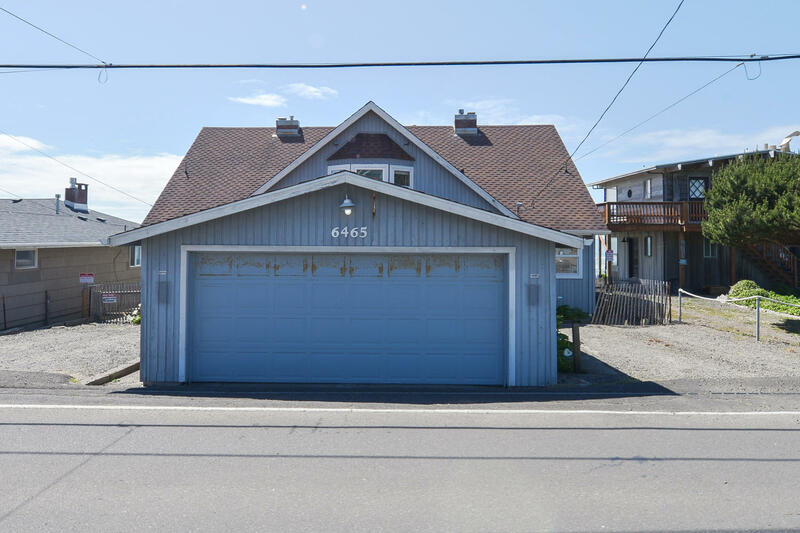 "we loved the "beachy" feel of this well kept older home; very quaint feeling, great location, wonderful ocean view, and the hot tub was perfect! we arrived in rain, then some fog, and then it cleared off to bright stars and wonderful warm sunny January day! couldn't ask for more..."
"We traveled from Michigan. Stayed a few days in Eugene and the coast was our middle segment. My boys, 14 and 11, wanted a hot tub. This place is so cute. The fireplace is cozy and the beds are super comfortable. It is perfect in every single way. We will definitely be back and highly recommend to anyone looking for somewhere special on the beach." "It was a wonderful getaway. It was close to the beach with easy access. The bedrooms(2 of them) look out onto the ocean. It is beautiful. The only downfall is the bedrooms are all upstairs, so if you have any handicap it would be difficult. Dealings with A-1 Beach Rentals was very easy. Very peaceful. Definitely satisfied with my stay. I would recommend this to a friend. May stay again with my family. " "Have stayed three times in your place, both North and South unit. Loved both of them. " "fun weekend at the beach, didn't want to leave. Perfect location, nice views from house, nice walks on the beach. the house was very well stocked, kitchen, game cupboard, lots of beach toys- "
"It's excellent home with beautiful beach view. Easy accessible to the beach. Home is very clean with all the facilities. We all very happy and tried a lot to try extend our stay one more night. A1 beach rentals team is very friendly and cooperative. They are polite and helped us to make our stay smooth. Thanks." "Wonderful property right onn the beach! We watched sunsets, took amazing beach walks, built sand castles, and soaked in the hot tub while watching the stars come out. The game closet was perfect and having breakfast overlooking the ocean is unparalleled. We will definitely be back!"